Are there too many technology cooks in your C-suite? If so, you'd better get them following the same recipes and make sure they report to the CEO -- or risk business deterioration. Companies are banking on digital technologies to bring them closer to their customers. But the growing spread of digital responsibilities among CIO, chief digital officer, chief innovation officer, chief marketing officer and other roles can lead to confusion and power struggles in the C-suite, adversely impacting the corporate performance, according to Digital McKinsey. A third of 700 IT and business executives polled by the consultancy said that they didn't know which leader in their company was responsible for most digital technology functions. The uncertainty over who owns digital assets such as infrastructure operations, application development, ecommerce, analytics and digital marketing stems from companies splitting tech tasks among too many leaders, Christoph Schrey, a Digital McKinsey associate partner, tells CIO.com. You can blame the issue on the digital transformation fever sweeping the world. Most companies traditionally either had a CIO or CTO leading technology initiatives. But the rise of the CDO -- McKinsey says 14 percent of companies now have one -- and the increasing pull CMOs have in tech functions means companies now have two C-level digital leaders on average. Some companies have six or more CxO-level technology leaders. "With more CxO-level leaders driving digital and technology work, the alignment on roles and responsibilities becomes even more difficult," Schrey says. Some organizations have found success by clearly delineating their CIOs and CDOs responsibilities. They’ve installed a CDO to lead customer-facing solutions, such as mobile applications or websites, and partner closely with the CIO ensure the app or website is properly integrated into back-end systems. Successful collaborations generate a symbiosis where the CDO and CIO ensure each other’s success. At some companies, power struggles break out when progressive, fast-moving CDOs quickly gain favor over a more deliberate CIO. "That's a problem because all of these functions need to work effectively together to bring solutions to customers and if they are not aligned they break down," Schrey says. Further disconnects occur because tech leaders typically report to different leaders in the organization, which can create competing tech factions. For example, of the 57 percent of survey respondents who said their CIO owns technology, 47 percent said their CIO reports to the CEO, with 19 and 16 percent indicating their CIO reports to the COO and CFO, respectively. 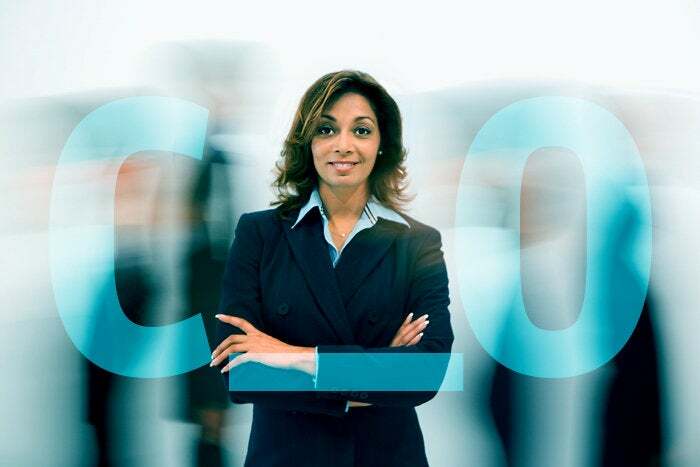 Of the 14 percent of companies with a CDO, 39 percent report to the CEO, with 10 percent and 11 percent reporting the COO and CIO, respectively. Asking CIOs and CDOs, who must often partner to deliver capabilities, to report to different C-suite leaders is another potential hazardous strategy. Salvation may lie in getting multiple tech stakeholders to rally around and align their departments to a single operating model, says Schrey. There is no definitive path to this. Rather, each department must understand the end-to-end processes unifying the parties and reach a consensus on responsibilities. 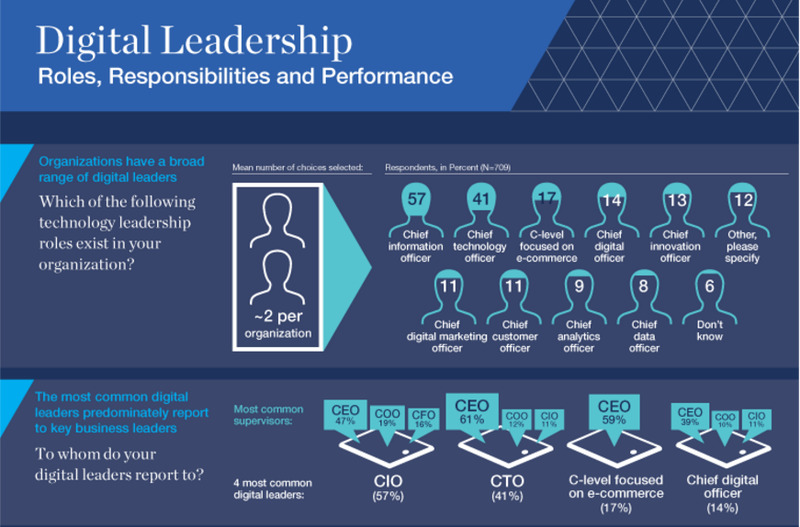 Another path to alignment includes elevating digital leaders to report directly to their CEOs. "In organizations where the CIO, CTO or any other digital leader has a direct reporting line to the CEO, IT/digital is perceived as more effective than in organizations where they do not," Schrey says. "This not only has an impact on the perceived performance of the organization, but also improves how much digital leaders participate in shaping the company’s business strategy, a goal desired by both business and IT." Some companies appear to be catching on. Among the organization changes Coca-Cola announced late last week, the beverage maker said CIO Barry Simpson would report directly to President and COO James Quincey, who has been promoted to CEO, effective May 1. The company said such a move would "boost visibility and focus on efforts to digitize all aspects of Coca-Cola’s business." Such alignment is essential if technology is going to work with the business to conduct a digital transformation. Industries remain less than 40 percent digitized on average, with 49 percent of leading companies investing in digital more than their counterparts do, McKinsey says. The stakes are high and the potential corporate rewards are great. IDC estimates that the economic value of digital transformation is worth $20 trillion, or more than 20 percent of global GDP.